Fifteen-year-old Muzna Saleem is passionate about writing and dreams of becoming a novelist. There's just one problem - her super-controlling parents have already planned her life out for her:Step 1) Get educatedStep 2) Qualify as a doctorStep 3) Marry a cousin from Pakistan. Oh, and boyfriends are totally haram.No one is more surprised than humble Muzna when high school hottie, Arif Malik, takes an interest in her. But Arif and his brother are angry at the West for demonizing Islam and hiding a terrible secret. 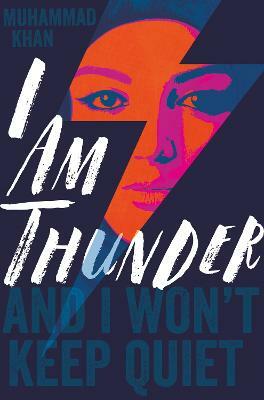 As Arif begins to lead Muzna down a dark path, she faces a terrible choice: keep quiet and betray her beliefs, or speak up and betray her heart?I Am Thunder is the debut novel from stunning YA voice, Muhammad Khan, which questions how far you'll go to stand up for what you believe. Muhammad Khan is an engineer, a secondary-school maths teacher, and now a YA author! He takes his inspiration from the children he teaches, as well as his own upbringing as a British-born Pakistani. He lives in South London and is studying for an MA in Creative Writing at St Mary's. He is working on his second novel for Macmillan Children's Books, Kick the Moon.